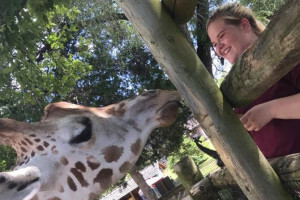 The senior Zoo & Wildlife Biology interned at Dickerson Park Zoo in Springfield, Mo., where she learned firsthand the ins and outs of animal care: feeding, cleaning, training, vet checks, and shifting the animals in their habitats. There, she got to catch a glimpse of her dream job: working with African animals. She enjoyed learning the personalities of Jimmy, an older lemur who loved to be hand-fed, and a giraffe named Milly. "Milly was hand-reared, so she loved people," Shupe explained. ""She would always come over to the feeding dock to get snacks and crackers. She had this thing she did when there were little kids around but weren't feeding her: she would stick her tongue out and basically lick their faces until they either backed away or gave her attention." She also learned firsthand the demands of her future career. 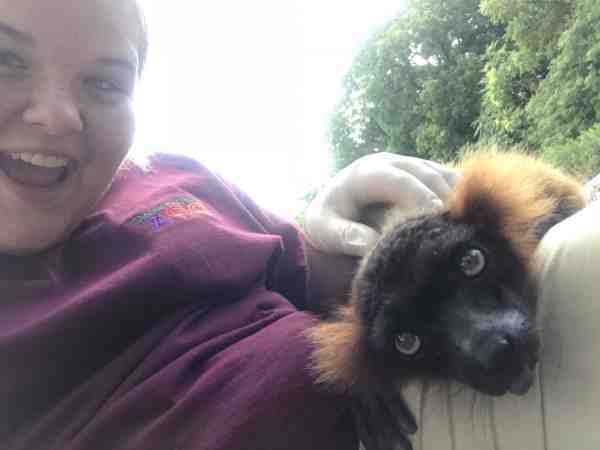 “Zookeeping requires a mix of different skills, including natural history and individual history of your animals, the ability to do difficult physical labor, a good set of people skills for both coworkers and the public, and the ability to analyze your animal’s behavior throughout the day,” Shupe said. During her time at Malone, Shupe has grown even more passionate about stewardship of the Earth. She was a Climate Leadership Fellow for Young Evangelicals for Climate Action last year, and this year has created the new environmental club, Malone for Environmental Awareness and Protection (MEAP), which is currently working with Ohio Ocean Foundation and the City of Canton. YECA is "a group of young evangelicals striving to live out what Jesus said was most important: loving God fully and loving our neighbors as ourselves - including faithful action and witness in the midst of the current climate crisis." Shupe has worked with YECA to bring the national organizer and spokesperson to Malone's campus. He is here today and will speak at the Spiritual Formation Opportunity be:justice tomorrow at 10 a.m. in the Silk Auditorium of Mitchell Hall. FAST FRIENDS. One of Shupe's favorite intern responsibilities was caring for Jimmy, and older lemur with few teeth. His food had to be softened and he would often cuddle with zookeepers as they hand-fed him.